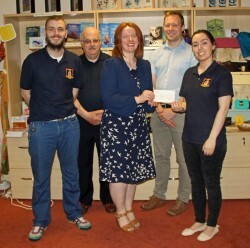 More great work in the community following the Regimental Parade in Northern Ireland, Brigade leaders were able to hand over £400 from the collection to aid The Leprosy Mission. If you've done something great in your community, email us at contactus@clcgb.org.uk. Pictured Victoria and Matthew alongside Melvin handing over the cheque.